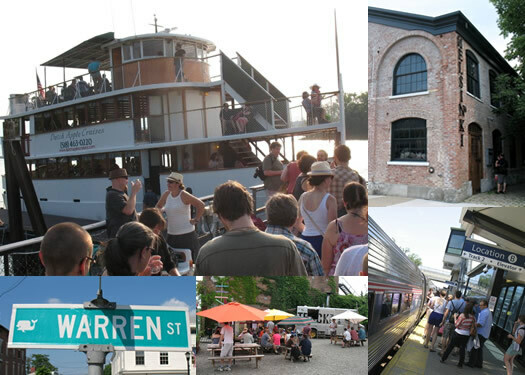 A day trip to Hudson via Amtrak® with a return sunset boat ride to Albany on The Dutch Apple Cruise Line. Friday night marks the grand opening of the Hudson River Café Coffee House at 227 Quail St. with an electronic dubs show to jump start the new venture. The 1,700-square-foot shop is the brainchild of Anton Pasquill, a graduate of the state University at Albany. Pasquill has garnered support from his mother and grandmother to get the shop up and running. The show Friday features Heady Productions - including Brother Suarez, Just the Sauce, DJ Far East, and Mr. Kissner. "We don't throw your typical parties, we're riding the wave of resurgence of electronic music and I will play any space I can find," said Matthew Davidowicz. Invitations for the event have been circulated via Facebook and word-of-mouth and Pasquill anticipates about 100 patrons Friday. "People should get here early on Friday, I'm expecting it to get full very quickly," he said. Not only is the Café a music venue but it also has a tranquil atmosphere, a full espresso bar, as well as pastries, a full sandwich menu, and free wireless internet. The espresso bar offers lattes, chai lattes and regular coffee. Hudson River Café gets its coffee from Capital City Roasters in the Hudson Valley, and each cup is made with freshly ground coffee beans. A cup of coffee runs from $1.75 to $4. In addition, the cafe also serves a full breakfast sandwich menu and a "Hudson Hogie" menu for lunch and dinner. The cover charge for the 10 p.m. show Friday night is $5. The Café will host a show on Saturday night, Dec. 11, when local band "Tarot" performs at 9:30 p.m.
New owner Pasquill has an economics degree and has worked for a number of years at local coffee houses and restaurants including both at the Muddy Cup and Subway. The moment he graduated he wanted to open something unique and exciting. His father suggested he look at spots on Quail Street and from there the Hudson River Café was born. Inside the old Hudson River Telephone Company building is a new interesting design with inviting lounge tables and couches, as well as old school arcade games. Hudson River Café is currently working on an "open mic" night schedule and will also host a regular venue – "starving artists Thursdays." Performers will have an hour or so to play a set of their music in exchange for food and drink, compliments of the café. It is really a local artists' playground. According to Pasquill, his main goal is to "ramp up" the café as a musical venue. The cafe operator hopes to develop the spot into a showcase for local artists as well. Every Friday of the month Hudson River will feature their work. The Café is big enough for two artists to display work at the same time. "This is what Albany is missing, come visit us," said Pasquill. October 3, 2010 - Biketoberfest/NJSPCA Poker Run - $15 for all coming!! Music, Poker Run, Contests, Prizes and Fun while supporting a great organization. Please help us raise money for the NJSPCA by joining us for a day of awesome music and fun! Admission: $15 at the door, in advance or if you're on one of the runs! There are 4 different poker runs all leading to an all day concert at Hidden Valley Resort in Vernon NJ which will be the last stop on all of the runs. For people participating in the runs at your first stop is where you will pay for the days events. For those who will be purchasing tickets online please bring actual ticket (not receipt for ticket, they will not be honored) to the first stop of the run you will be on. If you are not participating in the run bring ticket to the gate at Hidden Valley the day of the event. Doors will open at Hidden Valley at 12:30pm! 9:00 - 11:00 Indoor Show - House Band/Open Jam- Mike Lawlor, Mike VanTine, Tim Roberts. NEW YORK – The U.S. Army Corps of Engineers, New York District, has awarded a $3.3 million contract to Great Lakes Dredge & Dock Company of Oak Brook, Ill., to perform maintenance dredging of the Hudson River Federal Navigation Channel to improve access for ships going in and out of the Port of Albany. Approximately 60,000 cubic yards of material will be removed from the Albany Turning Basin and placed upland at the federally owned Houghtaling Island Placement Site. Work required to prepare the placement site to accept the dredged material is expected to begin in mid- September. A mechanical dredge is anticipated to be on site in early October to begin actual in-water dredging activities. The $3.3 million includes $575,000 from the American Recovery and Reinvestment Act, better known as the President’s “Stimulus” package. The stimulus money is specifically designated for work at the Houghtaling Island Placement Site to increase its capacity. The Port of Albany is located approximately 125 miles north of the New York and New Jersey Harbor up the Hudson River and can accommodate ships with up to a 32’ draft. Summer at the NYS Museum! 8/19 - Food for Thought: "Philospher Kings"
There is certainly something special about playing at the WAMC Performing Arts Studio. I didn't know what to expect the first time I played there, but after a terrific experience, I knew I would go back again and again. The staff is great, the sound spectacular and the audiences are warm and responsive. It's all you could want from ANY venue and nestled right in the heart of Albany. Who knew? 9/11 - Asbury Shorts New York: 30th Anniversary "An Evening of the World's Best Short Films"
9/16 - Food for Thought: "Queen of the Sun: What are the bees telling us?" 9/23 - Film/Discussion: "The Shadow Effect"
All tickets are for GENERAL ADMISSION seating - no reserved seating. The Linda - WAMC’s Performing Arts Studio does not exchange or refund tickets purchased for events at the Linda unless WAMC cancels the show. In that case we will contact you with options. If you have any questions about this policy, please feel free to contact Howard Glassman at 465-5233 ext 145. Thank you. The Linda is handicapped accessible. Your event ticket does not include parking. Click here for parking information.